Tunisia, Matmata is the small city in the south eastern province of Qabis in Tunisia and people like to live in their underground houses in this unique city. 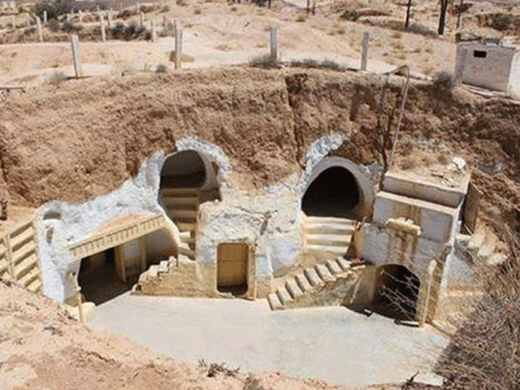 According to the foreign media, the residents of the Tunisian city, Matmata prefer to build their homes underground and they like to live in these underground homes. The residents of the city are Berbers and they like to dig the cliffs and mountains to build their homes and this city has gained the popularity because of its underground homes around the world. The local people of this city like to live in the traditional environment and in the simple life style and they also want to keep them hidden in these underground homes. These people also try to protect themselves from the environmental changes and the severe conditions of the weather. A Hollywood movie was shot in this city in 70’s in the city of Matmata and this city gained the popularity around the world because of its underground houses. The tourists of different countries started coming in this city to watch the unique dwellings of the local people. The underground dwellings and the environment can become attractive for the people coming from other countries of the world. The caves and the underground houses of this area can have the resemblance to the imaginary areas and makes this city unique and wonderful.